And we’re back! We’ve been busy lately with our jobs and side projects, but we’re still very much here and always expanding our sustainability projects. We’ll be trying to keep to a posting schedule of 1x/week from here on out. There’s a lot to update on! So we’ve started keeping meat rabbits. I did a lot of research before we jumped into this. Though the quails were a nice little gourmet meal, you don’t get very much meat off of them, so you have to butcher quite a to feed a family. 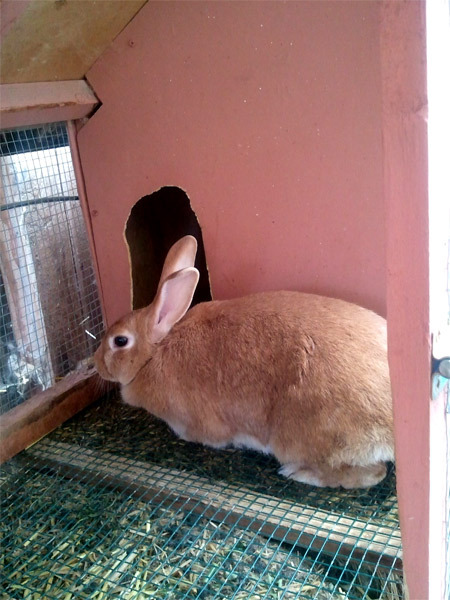 Rabbits are quiet, don’t take up a lot of space, and are easy to feed. Plus, their poop is great fertilizer – it doesn’t need to be aged before being thrown on the garden (though I recommend you make sure the urine is evaporated). 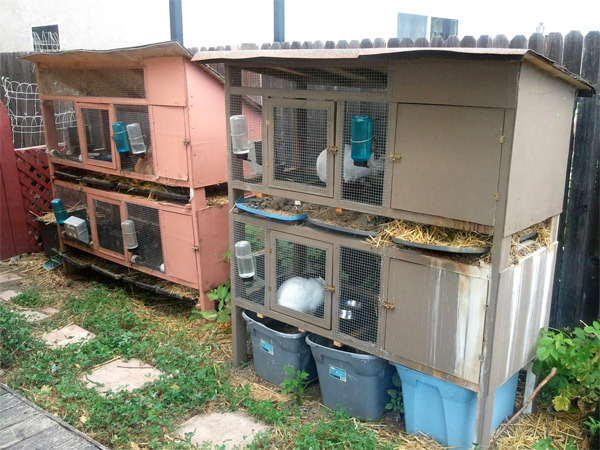 We modified our first hutch for rabbits, and constructed a second one (see Rabbit Hutch Complete). This design is working okay for rabbits. I’m brainstorming some ideas right now for better functionality and to have a more natural setting for the rabbits, while keeping in mind space restrictions. We have two does, and one buck. She just finished weaning a litter of ten, and is getting a well-deserved break! Hoi, hoi u embleer Hrair, M’salon ule hraka vair. 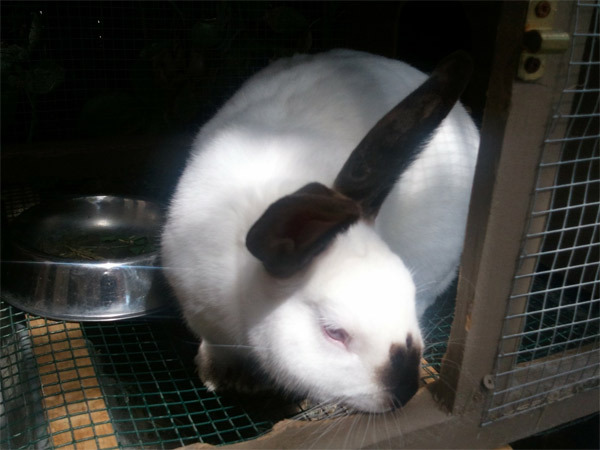 Mudder is a meat rabbit mutt – ½ satin and ½ rex. She’s amazing, consistently bearing litters of 8-12 and doing a great job of caring for them. She hadn’t a lot of human interaction before we acquired her, so she’s a little shy, but she’s warmed up a bit. Cookie is a Californian, a breed bred for their meat. To be honest, she’s a bit dull. We’ve talked about possibly replacing her in the future. She doesn’t bear very large litters, and she doesn’t seem to notice when she’s squishing her babies. Bigwig is also a Californian. He’s huge, friendly, and does his job well. 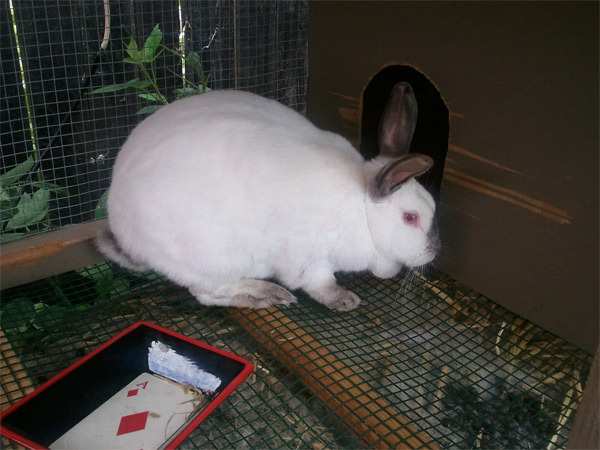 There are several breeds that are known for being good meat rabbits – meaning they have a high meat to bone ratio, get to slaughter weight quickly, and are efficient users of their feed. You can use any type of rabbit, honestly, but you’ll get best results with meat rabbits. The most popular types where I live are Californians and New Zealands. Don’t get Flemish Giants. They may be tempting because of their size, but their bones are huge, so you end up not getting a lot of bang for your buck. We got Mudder from someone on the meatrabbits list on Yahoo! and the other two were craigslist buys. Each were $20. We buy 50lb bags of feed from our local feed store for $14/bag. We’re also growing a lot of things the rabbits can eat, as well as foraging. We feed them rosebushes, grape leaves, fruit tree branches, grass clippings from our lawn, clover, raspberry and blackberry branches, dandelions, veggies, and bindweed (grows as a weed in our lawn and beds). We’re also planting alfalfa to feed them. Post to come detailing rabbit feeding! We have clover and raspberry bushes growing in here. We have trays beneath to catch their poop, and worm bins below Bigwig’s pen. I’ll go into more detail about the slaughtering and butchering process in another post. The rabbit meat itself I’ve found is very similar to chicken (so much so that my husband keeps accidentally calling it “chicken”) and can be used in anything chicken is used in. It’s a bit drier, so you have to be careful not to overcook it. Breeding and babies post to come as well! I’ve definitely enjoyed keeping rabbits so far. The initial set-up is quite a bit of work, and slaughtering the first couple times was difficult. But the reward is worth it – fresh, home-grown meat without chemicals, hormones, or unclean conditions. ← Singing the Praises of Fresh Beets! At what age do you eat them? Will you please do a segment on butchering? This is the one thing that holds me back, but know its got to be done. Hi Sarah! I’m planning a segment (1 of 2) on butchering later this month, the week of 7/16, so check back! We slaughter ours when they reach 5lbs, which tends to be between 9-11 weeks. Some breeds grow more quickly, and some grow more slowly. Smaller litters also tend to grow more quickly. Less competition, I suppose.